Preheat your oven at the highest temperature available for 10-15 minutes. 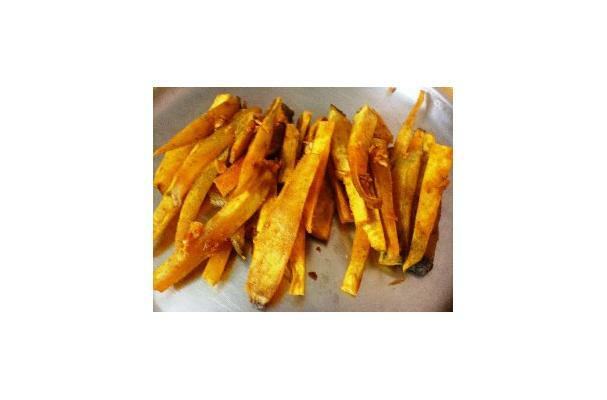 Peel the skin off the sweet potato and slice the potato into French fry-sized slivers. Smash up or grate the garlic into very tiny pieces. Combine the oil, garlic, chilli powder, and salt to make a batter. Dip each potato chip into the batter, coating well. Lay the chips on a baking tray. Dust some corn starch on top. Bake the potatoes for 25-30 minutes or until the potatoes are done.